Choosing the right oven depends entirely on one’s cooking habits. Both conventional ovens and convection ovens have pros and cons worth considering. Identifying how they are different is a good place to start. A conventional oven is an indispensable kitchen appliance that can cook, roast, and heat food by using either natural gas or electricity. It can cook meat or casseroles and bake cakes, bread, and other desserts. In conventional ovens, the heat source is stationary and usually operates at the bottom of the oven. Heat rising from below can produce small pockets of warm and cold air which may result in an uneven cook. As heat rises, the top portion of the food cooks faster than the middle part. This cooking method is typically ideal for roasting and baking. Depending on the type, ovens are controlled in many ways. The most basic ovens run continuously with only preset settings that can control the cooking temperature. Newer conventional ovens come with a thermostat that selects the temperature with which they will operate. A timer helps ensure the oven can be turned on and off at the desired time. A convection oven is also called a fan-assisted oven or fan oven. It features a built-in fan that circulates the heat generated by the oven’s heating element. This function typically results in an even and faster cook. Radiant heat sources located at the bottom and top of the oven ensure better heat transfer and cooking speeds. Some convection ovens have their heating elements located in an outer enclosure and away from the food. Cooking temperature requirements can also be lower with the combination of thermostats and heating elements inherent in convection ovens. There are a few variations of the convection oven. An impingement oven features a higher hot air flow from below and above the food. Restaurants use this kind of convection oven to cook pizza in particular. There’s the convection microwave oven, which is a hybrid of the convection oven and the microwave oven. It cooks food as fast as a microwave oven and features a browning ability which convection ovens are well-known for. So what’s the difference between a conventional oven and a convection oven? The conventional oven is the forerunner of today’s high-tech home cooking appliances, particularly convection ovens, and other types of ovens. 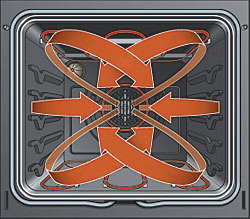 A conventional oven’s most distinct feature is its heating element placed at its bottom part. Although this accounts for an uneven cook of the food, this method is usually applied in baking and roasting. A convection oven is known for its built-in fan which is responsible for circulating heat within the oven chamber. 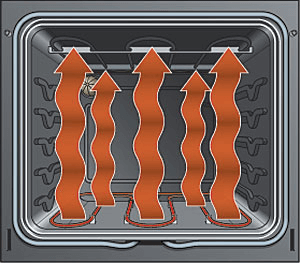 Heating elements are located at the top and bottom portions of the convection oven. These characteristics usually result in an even cook and a faster heating process compared to a conventional oven. The most basic conventional ovens use timers and feature simple heating controls that run continuously on preset heating levels. In contrast, convection ovens rely on thermostats to detect the amount of heat needed to cook, hence they are also energy efficient.